When user create new record in Salesforce, such as Contact, we can set default value on a picklist field, example: Active default to True. Select "Make this value the default for the master picklist", if any other value selected as default prior, it will be auto deselect. Recently we have a case, a group of users have default value, and they do not want that value selected by default. Okay, that is easy, just follow above steps to deselect the default value. 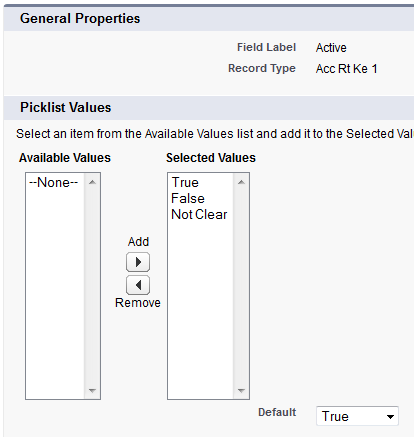 But, there is no default selected value for that picklist field, confuse... ? Finally, we found there is Record Type for that object, those User Profile only have access to one of the Record Type, that's why when user create new Contact, it do not prompt them to select a record type. If the Object has Record Type, Salesforce will use default value defined in Record Type, not default value selected in the object level.